NamicSoft uses Microsoft Word’s feature called Content Control, to mark sections of a Word file where NamicSoft will insert data. A Word file, with Content Controls, is used as a template file for NamicSoft. To work with Content Controls you first need to enter Design Mode (a guide is provided here). The following Content Controls are available in NamicSoft. 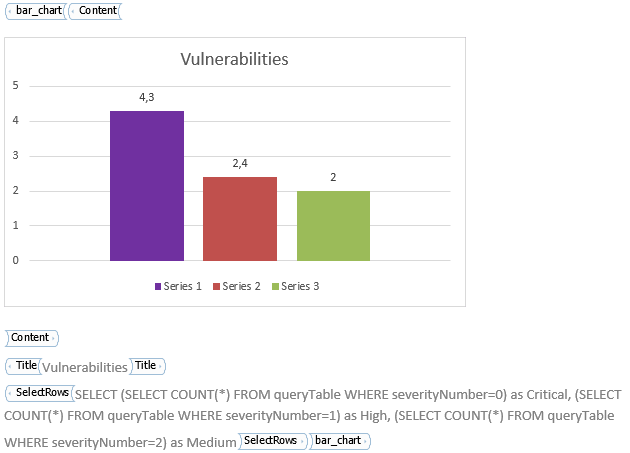 Raw_table_columns is used to present information about a single finding (e.g. 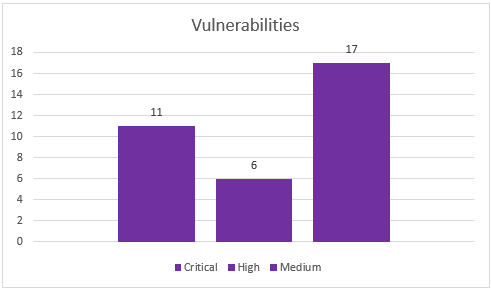 a host, a vulnerability) divided over multiple columns on one single row. Each finding will be presented on a separate row. Raw_table_rows_v2 is used to present information about a single finding divided over multiple rows and tables. Each finding will be presented in a separate table. This content control do support an arbitrary number of columns. Raw_table_rows is used to present information about a single finding divided over multiple rows and tables. Each finding will be presented in a separate table. Please note that the raw_table_rows content control only supports one and two columns layouts. Generally we do recommend using raw_table_rows_v2 instead since it allows for more flexible designs. 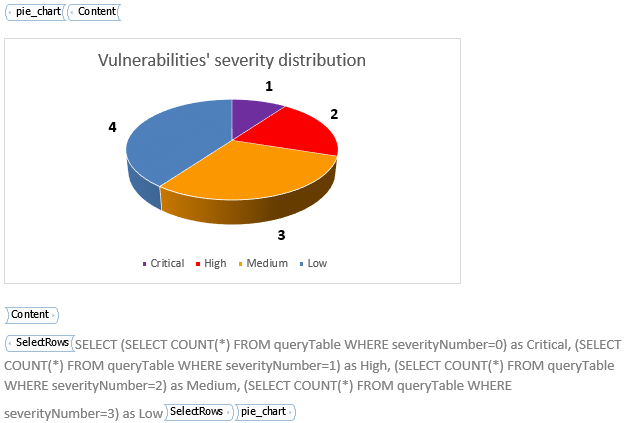 The pie_chart is used to present a pie chart overview of your scanning results. It can have any number of slices. The bar_chart content control is used to present results in a bar chart. The chart can have any number of bars. Please note that the coloring of each bar can not be set in the template. We do plan to address this issue in a future version of NamicSoft. Please let us know if this is an important feature for you. The Repeat content control will repeat its content. The content can be a table and/or text fields. Please note that charts are not currently supported to be included in a Repeat content control. The Conditional content control can be used to only present information if a certain criteria is met. The Conditional content control is normally used together with the SelectValue content control. The SelectValue content control is used to present a single text. This can e.g. be the name of a host or the number of found vulnerabilities. 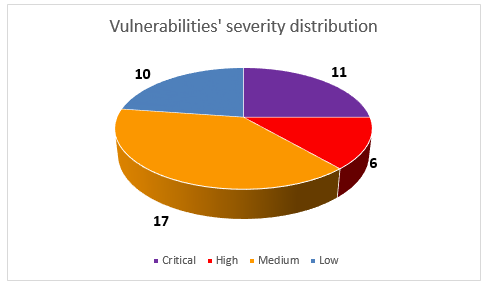 This content controlis usually used to provide aggregated information in the beginning of a vulnerability report, or used in the Repeat content control.